Photography by Kevin Wing.Last year these four motorcycles would have been part of our big-twins comparison. Then the Kawasaki Vulcan 2000 upset the order of things. All by itself it created a mega-twin class into which we swept the other oversized maxi-Vs, the Honda VTX1800 and the Yamaha Road Star 1700. That new uber-twin class narrowed the number of bikes eligible for this comparison, which we limited to V-twin-powered straight cruisers with displacements from 1400cc to 1600cc. Even so, we could have included more than 20 models, too many to make a focused comparison. The displacement limits eliminated Honda and Yamaha, but Kawasaki still makes 1500s and 1600s, Harley has a full range of 1450s, Victory's line is composed entirely of 1500s and Suzuki sells a 1400 (actually 1360cc), 1500 and, new this year, a 1600. However, we knew from past experience that there were some bikes that wouldn't be competitive. Harley's Dyna series has not impressed us recently, so we didn't ask for one of them. It took a bit of discussion to decide which Harley Softail we wanted, but we finally settled on Harley's bestseller, the Fat Boy, which topped our 2000 big twins comparison. Kawasaki has a pair each of 1500 and 1600 models. We might have chosen the new 1600 Mean Streak, which in 1500cc form was our pick from our '02 big twins face-off. However, the agreement between Kawasaki and Suzuki to share models has led to one design becoming both the Kawasaki Vulcan 1600 Mean Streak and, with minor changes, the Suzuki Marauder 1600. From past experience we knew Suzuki's 1400 and 1500 Intruders were not going to be front-runners here, so we took the Marauder 1600 as Suzuki's designated hitter. That left three Kawasaki Vulcans. The unique retro 1500 Drifter and the somewhat dated 1500 Classic might uphold the honor of the Vulcan line (and the carbureted 1500 Classic, at under $9000, is certainly more than competitive on a cost basis), but the Vulcan 1600 Classic appeared to be the obvious choice. Victory offers two models, the successful Vegas or the new Kingpin, which is closely based on the Vegas with a slight bias toward comfort and handling and a more traditional look. Naturally we wanted the Kingpin, which we hadn't tested yet. The Fat Boy might be considered the prototype for this entire class, and certainly Harley's competitors would love to have such a successful motorcycle, especially one that has been selling as well as the Fat Boy has for over a decade. Powered by Harley's dual-counterbalancer, twin-cam, 1450cc air-cooled twin with a clean Softail frame wrapped around it, the Fat Boy epitomizes that particularly American wide, fat look. Although it retains distinctive features such as disc-style cast wheels and that shotgun-style exhaust configuration, competitors have frequently sought to imitate other parts of its make-up, from the chunky 16-inch wheels wrapped with full fenders to the tank-top instruments, covered fork legs, the fork nacelle backing the headlight, the chrome airbox alongside the engine, the floorboards, the hidden-shock rear suspension and the low, wide saddle. Although it comes up short in a few areas such as a mere single front brake disc, the current-generation engine and chassis make an impressive functional package, too. You can clearly see the imitation in Kawasaki's Vulcan 1600 Classic, which adopts many of the same styling cues as the Fat Boy, right down to the fork cover behind the headlight, though with 66.7 inches between the axles the Kawasaki is considerably longer than the Fat Boy's 64.5-inch wheelbase. Of course, the Vulcan also has a liquid-cooled 1552cc engine with overhead cams and four valves per cylinder instead of the Harley's pushrod valve operation and two valves in each combustion chamber. The Vulcan's five-speed transmits power to a shaft final drive instead of the Harley's belt, and the Kawasaki uses twin rebound-damping-adjustable shocks to suspend its rear end. They are placed in the traditional location alongisde the rear wheel instead the Harley Softail frame's hidden location under the bike. There is also a huge difference in price. The Kawasaki lists for $10,499 in your choice of three colors. The Fat Boy starts at $16,245, and that's before you add our machine's fuel injection ($600), a color other than black ($240 to $585 extra) and other costs including freight and dealer profit. Victory's new Kingpin also suggests that fat is where it's at, being a more filled-out version of the successful Vegas on which it is closely based. The deep fenders are the big visual difference between it and Victory's first big hit, but the Kingpin also offers an inverted cartridge fork, a wider 18-inch front wheel instead of the skinny 21-incher on the Vegas, floorboards and standard cast wheels. If you order between August and October using Victory's Custom Order Program, you can change those last two items, picking from three wheel choices (including wire spokes) or selecting footpegs as well as different paint, an HID headlight and engine finish. 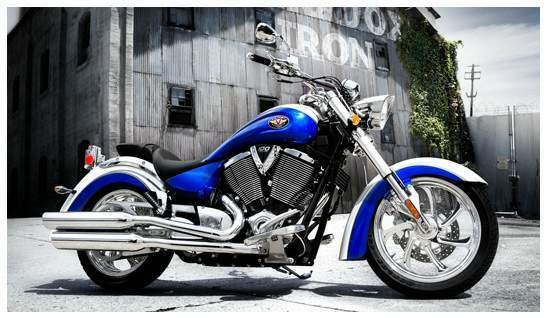 Victory's fuel-injected 1507cc engine employs overhead cams, air/oil cooling, and has a belt final drive. It has evolved tremendously since the first Victory was introduced using the same design back in 1999. The current engine shares virtually none of its parts with the original. The Kingpin has the latest-generation Victory single-shock chassis shared with the Vegas, and it enjoys its own clean, distinctive styling, with lines very much like those of the Vegas. Despite the fatter front tire, Victory stuck with the Vegas' single disc brake up front. 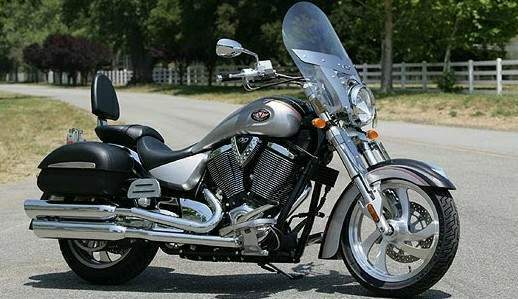 Victory adopted fewer of the usual styling features than most of the big twins. The airbox, for example, is concealed under the tank instead of hanging alongside the engine. The inverted fork legs lack covers (though they have a heft look, nonetheless), and the speedo is located in front of the top fork crown. Victory sought a price point between Harley and the Japanese bikes, and the $14,999 buy-in hits it. It is also $350 more affordable than the Vegas. The final bike in this comparison, the Suzuki Marauder 1600, is half of the first modern split-brand street model shared by Suzuki and Kawasaki. It is actually manufactured and sold by Kawasaki as the Mean Streak for the same $10,999 price. Both bikes are functionally identical and almost so visually, the rear fender treatment being the largest variation. (For a complete rundown of the differences, see our comparison of teh differences.) As a result, the following discussions of performance apply equally to the Mean Streak. The 1600 Marauder/Mean Streak is an upsized version of the 1500 Mean Streak, using the same chassis but with the extra 82cc of the 1552cc "1600" engine introduced for 2003 in the Vulcan Classic. As the performance platform of the big Vulcan line, the Marauder/Mean Streak engine gets juggled cams and bigger injectors and valves as well as remapped fuel injection for a bit more kick than the laid-back Classic. The chassis features inverted fork legs, air-adjustable rear suspension on a beefed-up swingarm and sportbike-like 17-inch cast wheels with radial tires. Six-piston calipers squeezing dual discs up front give big stopping power. The streetrod theme carries to the instruments—the speedometer and tachometer are set in front of the triple clamp—and the use of footpegs, a smaller 4.5-gallon gas tank and a slightly canted-forward riding position. While a motorcycle's look suggests how it will work, the proof is in the putting. With fuel injection on all four (an option on the Fat Boy), starting is seamless all around, once you find the ignition lock. This group squelches the find-the-keyhole game we usually play with a group of cruisers. The Harley and both Japanese bikes put the ignition locks right up in front of the rider on the tanks, and the Victory puts it down on the left side of the engine—almost as convenient. All four are ready to go in a few seconds, even on a cold day. The Victory's pretty lines always started conversations. It also got a lot of attention when leaned over since it drags easily and hard, startling small animals and passers-by. The Harley has the heaviest clutch pull, though the Vulcan's engaged somewhat unevenly and sometimes didn't disengage when first put into gear in the morning, causing it to stall. The Victory has our favorite clutch here. Gear shifting was pretty even, with the Marauder getting nods from those who prefer a single shift lever with a footpeg to the heel-toe shifters that go with the others' footboards. All four shift smoothly (the Harley is the closest to stiff) and predictably and find neutral easily, though Kawasaki's unique neutral finder—also found on the Marauder—makes that a bit easier. The big-bang shifting of early Victorys is in the past, and the Kingpin's shifting was as quiet as any of the other bikes'. The 1600 Fi lacks in cornering clearance, though it handles solidly thanks to well-engineered suspension and strong, linear brakes.Although they are no longer the beefiest engines around, bikes with this much displacement are still expected to pack meaningful punch. The Kingpin lives up to its name in this category with the strongest engine in its class. The Freedom engine used in all Victory models makes great power—smooth and strong—from way down in the rpm band and comes on hard as the revs rise. The 'Pin will easily run away from any of the other four in a sprint, and ours ate up the quarter-mile in 12.77 seconds at 103.95 mph. That's just 0.54 seconds slower than the big, bad Kawasaki 2000. And it delivers the beans with civility&151no power surges or flat spots, and just a bit of abruptness caused by some drivetrain play. It will pull smoothly from just under 30 mph in top gear; the others in this group start lugging below 35 mph. Although "Fat Boy" doesn't sound like the best choice for twisty roads, the Harley's ground clearance allows it to lean over farther than the other three.Harley's fuel-injected engine also offers great power delivery and throttle response all the way, no matter what the rider does with the throttle. It also makes a respectable amount of power, pulling harder at all speeds than the two 1600s, though it can't keep up with the Victory. The Fat Boy posts a quarter-mile performance right in the middle of the 13-second bracket, getting through the lights at 97.91 mph. The Harley drivetrain is notably lash-free. Although it looks like the most aggressive bike, the Marauder comes in third over the road. It gets through the quarter in 13.60 seconds, going 98.21 mph at the end. However, power is controllable and arrives evenly, slightly disturbed by some drivetrain lash, presumably the result of drivetrain dampers. The similar Vulcan Classic has an even flatter power delivery. However, the difference in engine tune and the Classic's extra 40 pounds means it gets down the road with even less haste, negotiating the quarter-mile in 14.21 seconds at 90.24 mph. Since all four motorcycles have counterbalancers, none shakes enough to comment until your speed reaches figures that will get you ticketed in any state. The worst to be said, then, is that the mirrors on the Harley (which were accessory items) and Victory had slightly blurred images at highway speeds, though that may be due more to the mirrors than the vibration. The Suzuki was the smoothest of the four by a small margin. The Suzuki also has the most compliant suspension, making it very smooth on concrete-slab highways with small jitters, seams and cracks. However, on roads with more and larger bumps, that softish suspension makes the Marauder pitch around more than the other three, which have firmer suspension settings. However, those three bikes, though they transmit more of the road surface to you than the Marauder, are rarely harsh. The Classic in particular does a good job of controlling suspension while taking the edge off sharp bumps, and it has the best ride overall. Both the Fat Boy and the Kingpin give more notice of bumps and potholes, but only large, sharp road-surface defects come through enough to disturb the rider. Introduced last year, the Kawasaki 1600 engine is an 82cc expansion of the 1500 with extensive changes throughout. Details like the unsightly horn grate on us.Even if vibration and ride caused no one bike to shake out as an overall favorite, other comfort factors made bigger impressions. The Fat Boy, as seen in the photos, was delivered with a Harley accessory seat. It looked good and felt terrible—too narrow, limiting and hard. Fortunately, the standard Fat Boy seat is far more comfortable—nicely padded, well shaped and with some room to squirm. The Marauder saddle has an even better shape and pleases riders of most widths and lengths, with the most room to move around. Although those two saddles are good for several hours without a break, we began to squirm after two to three hours on the Kingpin, which has a firmer seat with a more limiting shape and less support. The Kawasaki saddle is disappointing, especially since it is the heir to a long line of great Vulcan Classic seats. Although the padding might be the right consistency, it is in the wrong places. There is little room to move around on the saddle and a wedge at the rear surface provides unwanted pressure and keeps you from being able to slide rearward. As a result, average to tall riders feel cramped and almost everybody develops the squirms in under an hour. Kawasaki used to have great seats on its Classic series, but the last two, the 1600 Classic and Vulcan 2000, have been disappointing. This engine differs from the Classic's left with 37mm instead of 33mm intake valves, bigger intake ports, 40mm instead of 36mm injector throats and new cam profiles.In terms of passenger support, however, the Vulcan was tops, with the (standard) Fat Boy saddle second, followed by the Victory, with the thin passenger pad on the Marauder dead last. The Kawasaki also fell to the bottom of the rankings for overall ergonomics, partially because of the seat crowding the rider forward, but also because of its wide handlebar—just over 35 inches—that makes the bike feel awkWard during full-lock turns, hanging you out in the wind. However, there was adequate legroom for everyone. The top riding position was awarded to the Marauder, though the Fat Boy and Kingpin, in that order, were close behind and got positive reviews, with shorter riders favoring the Harley. Cruiser builders walk a line between long, low style and cornering clearance. Somehow, though, Harley always seems to provide both. The Fat Boy has more cornering clearance than the other bikes here. The Vulcan Classic and Kingpin both come up short on lean angle, but while the Vulcan drags its floorboards well before anything hard, the Kingpin drags solid pieces right away, which unsettles the bike and if overdone can lift a wheel. The Marauder almost matches the Fat Boy for lean angle. Victory's engine is the power champion of the almost-big twins. It makes both the most horsepower and the most torque.The Harley also handles and steers well in general, though the Kawasaki is tops in steering response and precision. On the other hand, we really had no complaints about the Victory's or the Suzuki's handling or steering manners, and the Suzuki is the lightest-steering and most nimble bike here. The Victory wants to sit up the least if you brake while leaned over. In terms of stability in side winds, parallel pavement seams and other disquieting situations, they all do pretty well, though the Fat Boy's disc wheels make it susceptible to side winds and gusts coming off trucks. The Marauder was the clear favorite for braking performance. Its dual six-piston-caliper front brake gives the Suzuki the most powerful braking in this group, but it also allows great control and, like the Kawasaki, has a cam-type adjuster to adapt the lever position to different hands or a change of gloves. The Kawasaki has two discs up front and offers good braking power. It is also a bit more controllable because of more fork damping, which makes the first moments of a panic stop a bit less dicey. The two single-front-disc bikes are less impressive. The Victory's front brake gives more power than the Harley's, which requires a stiffer pull and even then is a bit underwhelming. Both the Fatty's and the Kingpin's brakes squeak, the Harley's all the time but most loudly when cold, and the Victory's when wet. Harley's suspension is slightly harsh but adequately damped.Aside from noisy brakes, the only other problem we experienced was the Kawasaki's slipping clutch. To be fair, the Classic's clutch got a thorough workout during our photo session when it served as the platform for group shots. The rider sometimes slipped the clutch rather extensively to keep things smooth for the photographer passenger. Still, we have not been impressed with the new clutch friction material Kawasaki adopted for this bike. Our previous example got quite grabby when heated up by stop-and-go traffic duty. For many riders, cruisers are all about style. Comfort, performance, handling, even reliability are all somewhere on the list. If head-turning power is your primary measure of performance, then the Kawasaki probably won't be your first choice. Despite some nice pieces such as the fork cover and headlight and generally nice finishes on the components, there are some pieces that come across as awkWard. There are a lot of nits to pick. Some critics grunted about the fender shapes and sizes and the side panels' effect on the lines. And a raft of details, from the ugly black license-plate bracket with its big reflectors to the after-thought-looking horn to the unused bracket behind the cylinders, made some think Kawasaki decanted this one before it was ready. But several people commented that the 1600 Classic was the best-sounding bike, with a solid exhaust beat undiluted by mechanical or intake noise. Riders who like performance themes were taken by the Marauder, but those who prefer a more traditional, clean style dubbed it "kinda funky." One also pointed out that the exhaust system you see is a false front for the real exhaust configuration, which makes some covert moves where you can't see it. It also doesn't produce the nice exhaust sound of the Classic. Like the Kawasaki, the Suzuki's rear suspension offers adjustable damping via a thumbwheel.We couldn't really get a consensus about which of the two American-brand bikes deserved most admired status. There are still lots of people who swoon over the Fat Boy because "it's a Harley." Asked why that's important, the usual answer is, "Because it's cool." Why is it cool? "Because it's a Harley." Like the T-shirt says, "If I have to explain, you'll never understand." We think that's a way of saying, "Actually, I can't explain." But if you are willing to pay for that sort of irrational appeal, you get the aura of Harley ownership and the emotional outpouring attached to it. But the Fat Boy obviously has something beyond its basic Harleyness because it is the most popular bike in the line. Of course, for some people, riding one therefore makes you a flocker rather than a leader, diminishing its appeal. We can find some irksome details, but since everyone has had plenty of opportunities to study a Fat Boy, you already know what you like and dislike about it and how much. Victory gets functional fat fork legs by using inverted legs.For most testers, the Kingpin was as unexpected as the Fat Boy was familiar. Lots of folks seemed surprised at how clean, detailed and original the other American bike was. There were a few riders for whom the Kingpin didn't quite flow, however, and their eyes usually got stopped by the rear fender's tail, which sort of stands off from the rear tire. Some also stopped at the side panels, which don't quite match the rest of the bike's lines. A smaller number found the fuel tank a bit puny amidst the other pumped-up parts. The tank was lifted right off the Vegas, which has a decidedly slimmer design; a fatter tank would better suit both the Kingpin's style and its more travel-oriented role. But there are plenty of visual points to admire, too, such as the raised spine that runs end to end along the bodywork. The bike sounds good, especially from the saddle, though riders are sometimes surprised to learn that most of the throb they hear comes from the intake. The Kingpin falls well behind the others in convenience features, however. It is the only bike here without a fork lock (just lugs for a padlock), self-canceling turn signals, a fuel gauge or even running lights in the front turn signals, something that makes a bike much easier to identify and track at night in traffic. It does have a neat little single-tool kit, however, and that tool will perform most of the chores an owner is likely to tackle. Although the Fat Boy has those four features the Victory lacks, it has no tool kit or storage for one. We do give it points for the ease of checking the oil level in its dry-sump lubrication system. The others require balancing the bike upright, but the Harley can be checked on its sidestand. We have heard horror stories about bikes toppling as owners crouched next to them trying to balance the bike while eyeing the oil-level windows on the crankcases. That's the system used on the other two bikes, and we wish Kawasaki would abandon it and make a system to check oil level on the stand. Since both the other bikes are built by Kawasaki, they provide similar detail amenities: clocks in the instruments' LCD windows, adjustable handlebar levers, automatic neutral finding, tool kits and helmet locks. The Marauder also has a tachometer. Like the Suzuki, the Kawasaki uses shaft final drive, which is heavier and creates more drivetrain lash than a belt. Some see it as more reliable, though.Of course, Victory offers an optional tachometer, which can be mounted in a few minutes using wiring already in place. A lot of the parts sold or being developed for the Vegas will also fit the Kingpin. Victory, as well as the aftermarket, is steadily increasing its accessories line. Since the Marauder is the same as the Mean Streak, and both bikes share many of the same components as the 1500 Meanie, you'll find a small but solid selection of accessories for it, even if the bike is not the sort that begs for a lot of bolt-ons. Some owners may also mix and match the cosmetic pieces that differ on the two Marauder/Mean Streak renditions—headlights, airbox covers, turn signals or rear fenders—to distinguish their bikes. Of course, the Fat Boy has far more accessories than the other three bikes put together. The accessories offered by Harley boggle the senses. Besides the very uncomfortable low-profile seat, our FLSTFI had a combination headlight nacelle/fork shield, billet grips with rubber insets and other changes from Harley's voluminous accessories catalog. The aftermarket has even more, so if you like swapping parts, the Fat Boy is king. Finding the right accessories and replacement components could help mold any one of these bikes to fit your riding plans. However, as delivered, our choice is the Suzuki Marauder 1600 (which also means the functionally identical Kawasaki Mean Streak). The Marauder is also the best buy here. The Harley-Davidson Fat Boy gets the nod for second, with Victory's Kingpin hot on its heels. Kawasaki's big Vulcan Classics have traditionally run near the front in our comparisons, but not this time. The poorly shaped seat, somewhat awkWard ergonomics, finicky clutch and some detail-appearance issues combined to dampen our enthusiasm. In fact, most of us would be inclined to pass over the 1600 Classic for the Mean Streak or the carbureted 1500 Classic still in Kawasaki's line. The latter bike is more comfortable—if less powerful and not as elegantly suspended—and $1500 cheaper. The ranking could easily change with your priorities, too. For one thing, bringing home a stock Marauder could get ugly when your steady passenger eyes that saddle. If power and stand-alone styling are what gets you going, then the Victory could earn its price. If you like the idea of being able to replace every single part on your bike with something shinier, flamed or sinuous (or if the phrase, "Because it's a Harley," makes sense to you), then the Fat Boy is your mount. If you are willing to apply some aftermarket fixes to the Vulcan's shortcomings, that might even work out for you, too. And how about the three bigger twins tested last issue? Well, the Honda VTX1800N would probably draw more of our testers than any of these bikes, despite the added cost. However, the overall difference between the new big twins and the once-big twins is not huge. If we'd had a Marauder (or Mean Streak) along for last issue's jaunt to Texas, it would have been in contention all the way. Brasfield: My how twins have changed since I stopped carrying Motorcycle Cruiser business cards! What would have been big twins just a couple of years ago are now merely very large twins. But that's all right with me. Riding this bunch of cruisers impressed upon me how little the manufacturer's name on the tank really had to do with the riding experience. All of these bikes are so competent that I found myself considering which would suit my mood rather than ranking them under likes and dislikes. With the sole exception of those dang turn signals, the Fat Boy offers the same level of refinement I'd previously thought I'd only find on a bike with metric fasteners. The Kingpin puts the Victory marque on the same level as the rest of these much older manufacturers—an impressive achievement in such a short time! (Now, gimme more ground clearance.) The cross-pollination between Kawasaki and Suzuki has delivered the best Suzuki cruiser I've ever ridden. I loved the Marauder. And the updated Classic is just more of the Vulcan line that I've always been fond of. Since I've got a big, new garage, I thought about weaseling and saying that I'd take them all, but I gotta admit that the Marauder struck me the right way. So there you have it, my pick of the littler. Friedman: The mighty have fallen. Kawasaki's big Classic has been a top-ranked V-twin since our first big twins comparison back in 1996. It has won or run with the leaders in every big twins comparison we have conducted. But with this quartet, it's number four. That isn't to say that a Kawasaki didn't win this comparison, it's just that this time it says "Suzuki" on the tank. In other words, the Marauder was my pick as well, followed closely by the Fat Boy. The Kingpin ranks a solid notch ahead of the Vulcan 1600 Classic. Of course, the Kawasaki Mean Streak is essentially identical to the Marauder, so it would have been top-ranked as well. Oddly, I think Kawasaki's carbureted 1500 Classic or Drifter would have done much better than the 1600 Classic, and the 1500 Classic certainly costs less. I'd also put Yamaha's 1700 and Honda's VTX1800N ahead of the bottom two in this group, though they would all beat the Harley's Dyna series and Suzuki 1400 and 1500 for me. Kawasaki's monster? I'd rank it about the same as the 1600 Classic, which means behind it when you factor in price. It is going to be interesting to see how the bikes in this class evolve now that they are essentially second-tier bikes. Ping Friedman at Art.Friedman@primedia.com or at ArtoftheMotorcycle@hotmail.com. Cherney: Never thought I'd see a 1600cc motorcycle regarded as "middleweight," but that sad day has arrived. These bikes still scream "full-size" to me, and nothing exemplifies that heft like the Kawasaki 1600 Classic. Technically, the pumped-up 1600cc motor works fine, but if you're going out for something more than a straight-line spin, you'll be disappointed by a sluggish chassis. Harley's venerable Fat Boy still manages to be a nice surprise, with its 1450ccs of visceral rumble and not-as-bad-as-I-expected-it-to-be handling. Still, cornering clearance is limited and brakes are lackluster, so it'll take a bit more than strong curb appeal to pry 17 large out of my tattered wallet. Victory's full-fendered Kingpin became a close contender with Suzuki's new Marauder, though, mainly because the Kingpin's steering was lighter and its four-piston front brakes stouter. A smooth, linear 1507cc Freedom engine didn't hurt either, and frankly, the Kingpin is the best-looking bike here. Still, it's not just out of spite that I'm picking the Suzuki Mean Streak (a spade is a spade) as the winner in this clunky quartet; it's because the thing is just plainly the most fun to ride. A snappy engine, good throttle response and smooth fuel injection make it the easy winner. The Marauder won't get many points for its patchy styling, but that's OK.
Lubrication: Dry sump, 3.5 qt. PERFORMANCEFuel mileage: 36-49 mpg; 44.4 mpg avg. Lubrication: Wet sump, 3.7 qt. Fuel mileage: 34-41 mpg, 38.2 mpg avg. Lubrication: Wet sump, 3.5 qt. Fuel mileage: 30-39 mpg, 35.4 mpg avg. Lubrication: Wet sump, 6.0 qt. Fuel mileage: 32-43 mpg, 37.6 mpg avg.